Police report only a handful of arrests. But once again, peaceful daytime protests gave way to angrier shouts and more defiant marchers as night fell – including some who argued angrily with one another. But well past midnight, there were no sign of police riot gear, tear gas or armored vehicles that marked earlier street skirmishes in the first week after Brown’s death. On Saturday afternoon, a diverse group of protesters – many of them children – marched peacefully alongside community activists and uniformed police as calm largely prevailed for a fourth straight day in north St. Louis County. 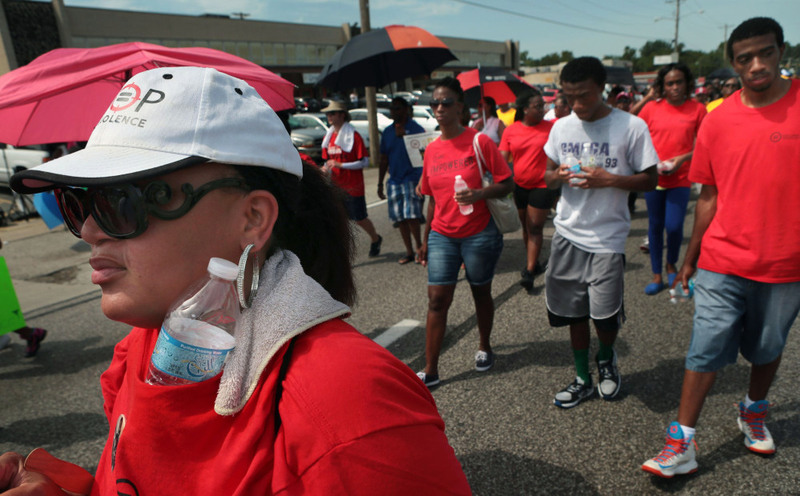 “When we go back to our communities, there’s a Ferguson near us,” said the Rev. Willie Bodrick II, 26, of Roxbury, Massachusetts, a youth minister and recent graduate of Harvard Divinity School. The images of well-armed suburban police officers confronting protesters in Ferguson with tear gas and rubber bullets after the Aug. 9 shooting of Michael Brown by Ferguson Officer Darren Wilson prompted widespread criticism of how local law enforcement agencies have used federal grants to obtain military gear from the Pentagon. President Barack Obama ordered the White House to conduct a review of those programs after calling for more separation between the nation’s armed forces and civilian police. About 10 miles south of Ferguson, supporters of Wilson rallied Saturday at a sports pub owned by the family of Mark Rodebaugh, a 21-year veteran of the St. Louis police department. Rodebaugh said he wanted to have the event because Wilson’s name has been “dragged through the mud.” He said it felt good to see supporters who weren’t officers or relatives of officers.